L'Anse aux Meadows National Historic Site is a Viking settlement from around 1000 A.D. - the earliest example of European presence in North America (except Greenland). 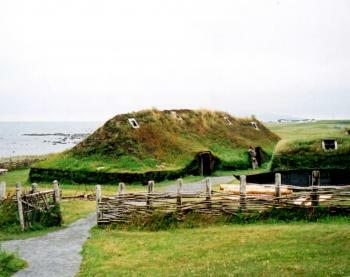 Temporate housing and workshops were built by Norse settlers, in similar style to those in Norse Greenland and Iceland. 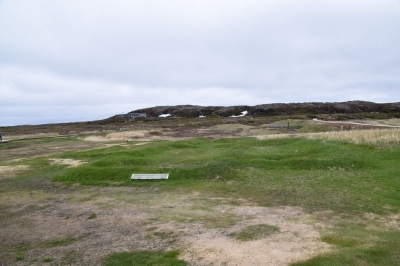 This archaelogical site is located on the northernmost tip of the island of Newfoundland, in an area previously inhabited by native peoples. The remains of this Viking village were discovered in 1960, and subsequently excavated until 1976. Besides the remains of the buildings, artefacts such as an oil lamp were found. L’anse aux Meadows is really a just small community right next to the site where the Norwegian Leiv Eiriksson and his men first time set foot round 1000 A.D. It’s a 5-6 hour drive from Red Bay (waiting time for ferry Blanc Sablon - Saint Barbe) and it’s a very pleasant drive (except for the potholes). On a chilly June day, we arrived at the very northern tip of Newfoundland which has an arctic climate. Even though we were coming from a couple of days in Red Bay Labrador this environment seemed kind of tougher and harsher. A thousand years ago though they say the climate was much warmer, so the Norse travelers might have had an another experience. They came to a continent of opportunities and make contact with the locals which must have been a challenge. They came back several times and just maybe they tied to settle, but no permanent settlement lasted. The visitor center is very informative and visual and it has a good 20 minute informative film telling the story of the Vikings and their visit in Helleland, Markland and Vinland introducing the concept Completion of the circle. Humans have for thousands of years been migrating from the origin in Africa through Europe and Asia, across the American continent all the way to the Atlantic coast. With the Viking voyage the humans completed the full circle around the globe. The site itself is not very scenic. There is little to see at first except for the spit of desolate land or dramatic coastland with icebergs passing by. From the visitor centre you follow a wooden path and after a 5-10 minute walk (depending on which direction you chose on the loop) you arrive at the archeological site or reconstructed collection of Viking houses. Like in other archeological sites, you have to use your imagination to visualize how it would have been. The reconstructed houses are what makes you understand what conditions these travelers made for themselves and with the actors around (a blacksmith, a kitchen girl and so on) makes it all “come alive”. It is actually very nice. The archeological site is a bit harder to grasp. You can barely see some small heaps full of grass, but with the reconstructed houses very near it is easier. After seeing the house site we also hiked the Birchy Nuddick Trail, a 2.2 km long interpretive trail that leads you through the habitats that have changed very little through the last ten centuries. This gives you another angle of what the Norse travelers originally met. Being a Norse makes you kind of proud visiting this place but also humble. How did these ancestors of ours manage this? In the 1960s the Norwegians Anne Stine Ingstad & Helge Ingstad studied the Viking travels and they finally revealed their secret! Both are great achievements although very different. L'Anse aux meadows lies at the very tip of Northwest Newfoundland. Nearby is the small town of St. Anthony, where we saw several icebergs and met some bikers, who were also exceptionally friendly and personable, like all Newfoundlanders. The Viking site of L’Anse aux Meadows is scenic, enabling you to believe that the Norse chose it partly for its beauty. Three icebergs were visible in the distance. Tall grasses, tiny wildflowers and horizontal forests brought Mistaken Point to mind. The Visitor’s Centre was beautifully done and informative with a lovely Viking ship replica. The UNESCO Plaque is very impressive! On the long but easily walkable path, there was not much left of the actual Viking remnants, marked with red flags or they might have been missed, and they had a model of what the village might have looked like in days of yore. Further on were replicas of what the town might have looked like with various buildings, such as an outhouse, a slave room, a blacksmith room and other areas with costumed people walking about. The roofs were rustic and nicely done with great woodwork, but in general, this part of the site rang a bit false. To get to the site, just take the Viking trail (route 430) to the end, which is a long, beautiful drive. The journey is 5 hours from Gros Morne, and it is well marked and easy to find. Some people recommended staying in St. Anthony as it is inexpensive, and noted for icebergs as mentioned before. The highlight of the drive is a photo opportunity and views of Flowers Cove Thrombolites Landscape! These are actually some of the earth's most primitive life forms. Around 1000 AD a group of Vikings established a village on the northern peninsula of Newfoundland in an area now called L'Anse aux Meadows -- a pre-Columbian European settlement in the western hemisphere commemorated in exactly zero national holidays in North America. 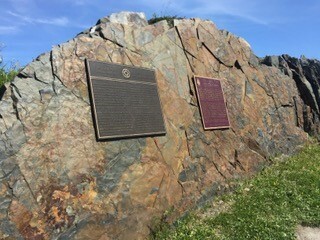 This historical event was not forgotten by UNESCO (or Canada), however, and L'Anse aux Meadows was selected as one of the first 12 World Heritage Sites in 1978. After I learned about this Viking settlement in North America in school, I made sure to visit when I took a road trip with my father through Atlantic Canada in summer 2006. The museum at L'Anse aux Meadows offered a comprehensive and informative history of viking exploration in North America, but the highlight of the visit was the archaeological site outside the museum. All that remains of the village are mounds where buildings used to stand; however, sod houses from the settlement have been recreated, and Viking interpreters offer tours explaining how Norsemen lived 1,000 years in the past. It takes a considerable effort to travel to L'Anse aux Meadows, but the Viking history on display and the extremely scenic coastlines of Newfoundland make this an unforgettable site to visit. 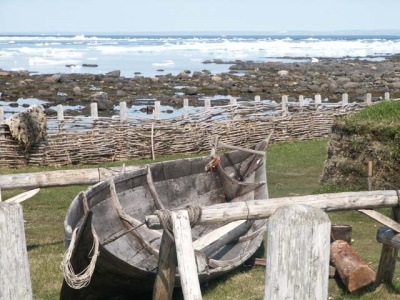 Logistics: L'Anse aux Meadows requires an automobile to visit. The settlement is approximately five hours north of Deer Lake Regional Airport and at least seven hours north of the Port aux Basques ferry terminal on Newfoundland. I first heard about Dr. Instad's excavations of a possible Norse site in the New World in "newsreels" (remember those! )in 1960 when I was 14. I knew at that moment that I HAD to make a pilgrimage there one day - and so I did so in 2007 to celebrate my 60th birthday. It was fascinating to walk through the ruins and look out on the Bay and see what the Norse saw 1000 years ago, and to realize that Lief Ericson had been here. The Visitor Center was excellent, as was the hospitality of the local people we met. I only wish the Museum/Visitor Center had small replicas of the sculpture commemorating the contact between the Norse and Native Americans-representing the final leg of the circumnavigation of the globe that had taken place starting with Homo sapiens' African Diaspora ~60,000 years ago. On the way back to the U.S. Gros Morne national park was a geological wonderland. I'm definitely going back - this time with bicycle, kayak and camping gear on my Element. My husband and I went here in August 2005 and were greatly surprised by the well-organized Visitor Centre and knowledgeable tour guides. Make sure to watch the film regarding the site's discovery by Dr. Helge Ingstad and his wife, Dr. Anne Stine. A meal at the nearby Norseman Restaurant is also a must! Visited in May, 2004 and even though the Visitor's Center was still closed, we were able to tour the huts and wander the coastline. The site in Newfoundland is allegedly where Lief Ericcson landed from Greenland. 2 sod huts have been completely restored and authentically furnished. A blacksmith's hut is also restored. The foundations of 6-8 other huts remain. The coastline is spectacular complete with mammoth icebergs, rocky cliffs and unusual plant life. Lots of reasonable places to stay in St. Anthony and the drive up from Gros Morne while 5 hours is beautiful. From "L'Anse aux Meadows National Historic Park" to "L'Anse aux Meadows National Historic Site"